BANGI, 9 July 2010 — Tengku Tan Sri Dato’ Seri (Dr) Ahmad Rithauddeen Al-Haj has been reappointed as the Pro Chancellor of Universiti Kebangsaan Malaysia from 1 April 2010 to 31 March 2012 under Section 11(1) the Constitution of Universiti Kebangsaan Malaysia. The reappointemnt of Tengku Tan Sri Ahmad Rithauddeen has been consented to by the Chancellor of Universiti Kebangsaan Malaysia, DYMM Tuanku Muhriz Ibni Al-Marhum Tuanku Munawir. 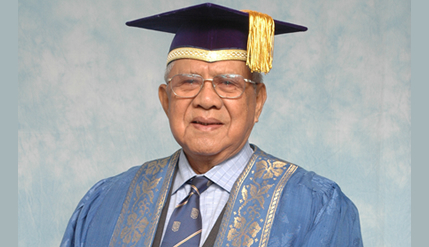 Tengku Tan Seri Rithauddeen serves as the Pro Chancellor of UKM from 1 January 1992. This is his eighth term and the longest serving Pro Chancellor of UKM. As UKM Pro Chancellor, Tengku Rithauddeen contributed much to the development of UKM as a well-known university in this region and in the international arena. Tengku Tan Sri Rithauddeen, who is a law graduate, began his creer in the Judicial and Legal Service since 1956. He later joined politics and held various positions in the cabinet as deputy minister and minister from 1970 to 1990. He is now involved in the corporate world and holds various positions either as director or chairman of companies.